The world's most powerful home theater receiver in a package the size of a typical preamplifier. And this beauty will please the most discriminating audiophile. Really. When you turn on your video component, the processor will choose the proper in put for you. All you have to do is adjust the volume the way you want, then sit back and enjoy. The same holds true if you wish to listen to a CD, watch a DVD and more. The automatic video format transcoder up-converts composite video and S-video to component video, allowing the Ultimate Receiver to act as your main video controller. We have also made the Ultimate Receiver highly flexible so you can easily adjust it to suit your taste. We started with his highly-acclaimed Theater Grand III Home Theater Preamp/Processor and then added seven channels of receiver-class power amplification. This receiver can drive speakers with impedances as low as four ohms, with 400 watts per channel at that impedance (for those uncompromising audiophiles who require the ultimate in power amplifiers with a lower noise floor, more power, virtually limitless dynamics, and one-ohm stability that can drive any speaker made, our separates systems are for you). Bob designed it to produce a warm and engaging soundstage – both your movie and music soundtracks will be smooth and dynamic. The Ultimate Receiver II adds Dolby® Pro Logic® IIx to its array of numerous surround modes including Dolby® Digital, Dolby® Digital EX, DTS®, DTS-ES®, DTS Neo:6®, and user-configurable all-speaker stereo. It also includes an incredible digital implementation our wildly successful Sonic Holography® Imaging, that substantially adds to the acoustic space of any stereo recording. The Ultimate Receiver II's control system takes into consideration the needs of the modern AV system. New in version II is video format conversion that automatically up-converts composite to S-video, and S-Video to component video to keep you from having to change inputs on your TV. The Ultimate Receiver II’s remote is a powerful new preprogrammed and learning LCD-based design (a digital image of the actual receiver remote is not yet available. 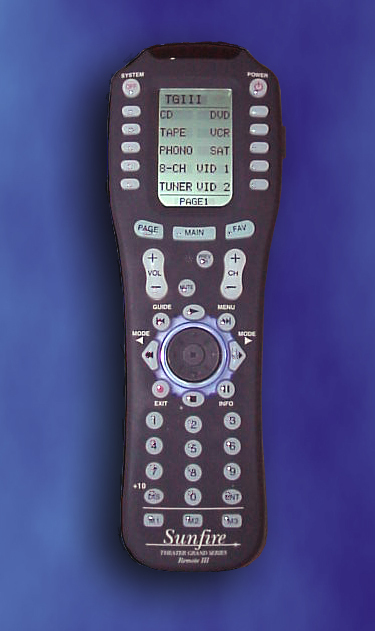 It is identical to a Theater Grand remote, but with 'RCVR' instead of 'TGIII' or 'TGIV' in the LCD window. The Ultimate Receiver II includes an RS 232 communication port to allow easy operation from any custom control system. The Ultimate Receiver II also includes an AM/FM tuner with 40 presets, an eight-channel input for DVD-Audio or SACD, a Phono stage, a digital output which is active for ALL analog and digital sources (even the phono input!) and much, much more.